A special sale showcasing works by the famous sculptor and his wife Jeanne-Claude, will be live on artnet Auctions from January 28 through February 6, 2014.
artnet Auctions is pleased to announce Christo, an extraordinary sale of over 40 prints, drawings, photos, and posters by the sculptor Christo (Bulgarian, b.1935) and his late wife, Jeanne-Claude (French, 1935–2009). The auction includes works that span the artists’ 50-year career, documenting their most spectacular environmental installations, funded completely through the sale of preparatory drawings and prints. The auction presents two exquisitely detailed collaged drawings, estimated at US$20,000 to 30,000 each, for an upcoming project entitled Over the River. The installation will require the suspension of a 5.9-mile curtain of fabric over the Arkansas River in central Colorado for a two-week period in 2015. A set of three lithographs entitled The Mastaba, A Project for Abu Dhabi, estimated at US$2,000 to 3,000, document another upcoming project. Comprised of 410,000 barrels, and measuring 492 feet high—eclipsing the pyramids of Giza in terms of size—The Mastaba, Project for Abu Dhabi will be the largest sculpture in the world, and the artist’s only permanent installation. 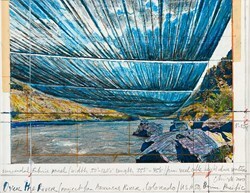 Over the years, Christo has created prints and drawings for projects that have never been realized. One of these is Wrapped Building, Project for 1 Times Square, Allied Chemical Tower, New York (1991), a project that proposed to drape the iconic building where the ball is dropped every New Year’s Eve completely in fabric. The project is brought to life in a collaged, three-dimensional lithograph that incorporates fabric and thread, and is estimated at US$10,000 to 15,000. Another unrealized project is represented in a collaged lithograph entitled Mein Kölner Dom, Wrapped, Project for Cologne (1992), estimated at US$10,000 to 12,000. For this project, the artists audaciously proposed to shroud the Roman Catholic 13th-century masterpiece completely in fabric. The auction features several pieces that document Christo’s earliest installations. In the artist’s 1962 notorious Wall of Oil Barrels—The Iron Curtain (1961–1962), Christo blocked off the narrow rue Visconti in Paris for eight hours with a barrier of 89 oil barrels to protest the recent construction of the Berlin Wall. Christo’s street installation, which outraged Parisians, is represented in this sale by an offset lithograph accompanied by a very rare artist’s book, both signed, which document the event, estimated at US$1,200 to 1,600. Between 1964 and 1965, Christo covered the windows of various shop windows in his Wrapped Store Front series. Several works related to this project are included in the sale, including Storefront Project (1965), a hand-drawn, mixed-media work estimated at US$45,000 to 60,000; Storefront/Project for Landfall Press (1978), a rare lithograph and collage Christmas card estimated at US$800 to 1,200; and Orange Storefront, Project (1991), a dimensional, mixed-media, collaged print estimated at US$4,000 to 6,000. Starting in the late 1950s, before he had the means to finance his world-famous environmental projects, Christo wrapped small objects, such as bottles, magazines, flowers, and books. He continued to work with these everyday objects in collaged prints through the 1980s onward. Some of the best examples in this auction are Wrapped Bottle, Project for Kochberg Spatlese (2002), estimated at US$2,000 to 3,000; Package on Radio Flyer Wagon, Project (1993), estimated at US$4,000 to 5,000; and Wrapped Telephone, Project for L.M. Ericsson Model (1985), estimated at US$4,000 to 6,000. The most enigmatic work in the sale is Wrapped Painting (1969), a lithograph printed on the front and back showing a painting draped in black plastic, estimated at US$1,500 to 2,000. Published on the occasion of Christo’s wrapping the Museum of Contemporary Art in Chicago, the print speaks to the very heart of Christo’s work. Once concealed through wrapping, a painting, building, coastline, or object is transformed into something that defies identification, urging the viewer to consider other possibilities. Christo will be live on artnet Auctions from January 28 through February 6, 2014, and more information can be found at http://artnetmarketing.com//christo.html.